Srishti stared at the flurry of activity from the window as she dialed her sister’s number. The bell had just rung in the school right opposite her house. A while back, when she worked, she had timed her mornings to these bells. The short break at the Jayanagar girls’ primary school had started. It meant the girls would shriek their way to the school gate to buy candies from vendors. Two, four, five, nine…Srishti counted the telephone rings as the girls ran out, as if on the count. A small group dressed in blue and white school uniforms had collected at the school gate. She disconnected the phone as she stared outside. She stared till she forgot she was staring at a form. And then she dialed again. Srishti had been trying Hansa’s number since last night. Her fingers pressed the number keys with unnecessary pressure this time. The school bell rang again. The girls vanished into rooms like they were never there ever. There was this old silence at the school gate now. Suddenly the sparrows on the guava tree outside the house seemed noisier. Srishti threw the phone; it landed on the other corner of the sofa, just where the printed cloth curled inside gently, right next to it was lying Tolstoy’s Anna Karenina. A blue bookmark peeped out, restless, unable to sit comfortably between a few read pages. Srishti reached for her phone again. The continuous ring echoed in her ear just like from last time, and before. ‘What is it?’ growled Hansa this time. Silence came between them. Srishti heard her answer and disconnected. Hansa sat in her office cubicle with an unfinished game of solitaire. She stared at the neatly aligned tableau of diamonds and hearts on her office desktop. Each card had a role in the family of thirteen. She dialed Srishti’s number as she stared at the mingling redness of diamonds and hearts. Srishti answered almost immediately. ‘Old place, same time. Better be early it’s a Friday,’ said Hansa before she disconnected. Brigade road seemed like those miniature copies of famous places: enacting Times Square on Friday evening. It was decorated with bright neon signs: blinking and calling; dancing and calling; pimping a better life. Jasmine flowers braided in white virginal strings were being sold by hawkers at the traffic crossing. Smoke smelt these flowers and stole their essence forever as men haggled over a right price. Some flowers sat wrapped in old newspapers on car dashboards, unaware of the treacheries expected as evening met the night. Everything was karoaking for attention. This street is under CCTV surveillance 24-hours was the only sign that hung in quiet sobriety. Steely Dan had just guzzled Bodhisatva at the Pecos bar. A smile came to rest on Hansa’s face as she climbed the spiral staircase; her eyes settled on an empty table, in a corner, farther away from the entrance. A young waiter smiled from the bar counter. It was a smile of recognition. Hansa smiled back as she walked towards her table. Eager to prove that he still remembered her he followed her, with her usual old order of a pitcher of beer. As he kept the beer mug Hansa showed two fingers. His dimples flashed. He returned with another mug and the complimentary pop corn. Hansa wanted to savor her first mug alone, but just as she poured the beer she heard her elder sister’s voice. ‘Ya, I will take a cab if it gets late Dheer.’ Srishti was reassuring her husband. She waved at Hansa from the door. Hansa could hear Dheer’s detailed instructions as Srishti settled on the chair opposite her. ‘Dheeeeeeeer… I’ll be fine. You know Hansa gets upset when she is made to wait. Hang up now! ’ Hansa sipped her beer lazily; her fingers circling the rim of the beer mug between sips. Boddhisatva finished. Pretzel Logic was playing. It seemed louder than the last number. A few early drinkers looked up from their glasses when the song changed. Almost immediately they drowned in their mugs again. 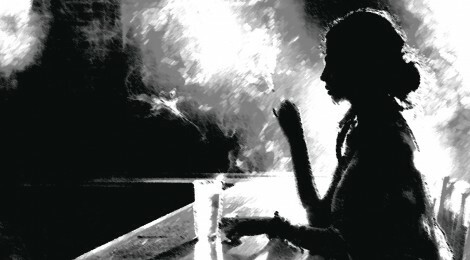 The bar seemed in a state of dilation: the smoke, the music, the quiet drinkers. Hansa poured some beer and slid the mug gently to the other side. Srishti turned around and ordered an iced tea. The beer mug sat in the middle of the table. ‘Not drinking?’ asked Hansa. ‘You know I can’t drink now.’ Hansa wondered if there was a fleeting accusation in Srishti’s you. The beer drowned the urge to ask. ‘It’s showing now,’ she said instead, pointing towards Srishti. Srishti yanked her kurta away from her body. Music changed. ‘Can’t buy a thrill. This is the first album of Steely,’ shrieked Srishti. Srishti’s whispering soon became loud singing. Her fingers were drumming the table in that rap-style, her head shaking, saying I-wanna-be-a-rock-star. ‘You’ve put sindoor?’ asked Hansa, shouting, so she is heard over Srishti’s loud singing. ‘Of couuuuurrrrsssse.’ Srishti’s words stretched tunelessly. ‘Hiiiisss motherrrrrr insistsssss. I rrrrub it offffffff in the toiletttttttt latttttttter.’ Her fingers found the middle of her forehead -‘Is it still there?’ she asked, as she rubbed the center of her forehead. ‘Actually, I forgot to rub it today. Had smeared a lot of it.’ ‘Some redness is still left,’ said Hansa. ‘Even now?’ asked Srishti as she stole a small sip from the unclaimed beer mug in the centre and winked. In a moment she gulped some more and moved the beer mug right next to her iced tea. ‘Let’s order something to eat.’ Hansa waved at the same guy who had served them before. She kept waving till he turned to walk towards them. ‘Chicken tacos, sausage and,’ Srishti turned towards Hansa. ‘Wanna add?’ Hansa pointed for another pitcher of beer. The young man turned to leave. ‘Chilli beef! Add chilli beef,’ screamed Srishti, her gaze following him as he walked through the smoke and chatter. ‘Do you think he heard me?’ She turned to look at Hansa. ‘By the way Dheer still doesn’t know I eat beef, so don’t blurt it out by mistake.’ Hansa sipped her beer, her eyes settling again on the mildly red forehead of her sister. Srishti gulped the left over beer. A loud burp found its way out. ‘Remote control!’ teased Hansa. ‘I guess, I’ll make it my last night of beef and beer.’ said Srishti, as she raised her empty mug, swaying it between two unmarked points in the air. ‘Beeeeeeeef and beeeeeeer; beeeeeeef and beeeeeeer.’ She sang. The movement made the shape of a small boat suspended in air. ‘Do you think this is right?’ Srishti asked again. ‘Why do you care what I think?’ Hansa looked away. The boy was walking towards them with the order. As if in a talent show he had all the plates vertically stacked on one palm, and was holding the pitcher of beer in the other. He announced the names loudly and then kept the order; a metallic thud followed every name: ‘Chicken tacos’, ‘beer’, ‘sausage’. Hansa and Srishti stared at each plate as the names were called. ‘Where’s the chilli beef?’ asked Srishti. His dimples apologized as he vanished again. ‘It isn’t about you…’ corrected Hansa hastily. But Srishti wasn’t listening. She was peering into her beer mug. ‘Do you think fishes can swim in beer?’ she asked cheerfully, ‘can their fins handle the viscosity?’ She stretched her arms slowly with a fish face and moved them up and down. Hansa laughed. This was the sister she knew. ‘No stupid, I am a fish,’ giggled Srishti. Some beer drinkers turned to look at her and turned away. Srishti stopped after a few swims in air. ‘What’s with the beef?’ She asked, rolling her eyes towards the bar counter. ‘This place also isn’t the same now.’ She sighed and started reading off the plasma screen behind the bar counter. ‘It will be a cancerian. A water sign,’ said Srishti and read aloud–‘Cancer: wait till next week to start new projects. Romance is seeking you this week. Lost friends and family will come back on their own when the stars are right. Lucky color is saffron and lucky number is nine.’ The noise outside the bar had increased. Hansa wondered if it was the usual brawl on the wait list. Meanwhile Srishti had moved onto reading the news tickers at the bottom of the plasma screen. ‘Warren Buffett has cancer,’ she announced. ‘See the ticker is running.’ She pointed at the lower half of the screen. ‘Wonder what it feels to be the richest man in the world with cancer.’ That is when someone shrieked outside. Srishti’s finger was still pointing at the screen as her eyes followed Hansa’s gaze. Hansa was surveying the faces of the fellow drinkers. But everyone looked the same, like before, drunk, chirpy, drunk. She tried to relax and read the ticker: ‘Warren Buffet diagnosed with cancer.’ The ticker crawled. ‘Oh that’s fine,’ Hansa shrugged, as she poured some more beer, ‘everybody has cancer nowadays.’ ‘You mean much like having it.’ Srishti laughed. ‘Everybody does that too.’ But Hansa wasn’t hearing again. Instead her eyes were glued to the entrance. A group of men were struggling to enter the bar. The noise inside had quieted. It was replaced by their slogans. Finally they managed to overcome the two guards. They rushed inside, breaking whatever they could get their hands on- throwing glasses, toppling tables, dashing for collars. The dimpled waiter ducked behind the bar counter. He was trying to save some glasses when they caught him. He was pushed onto a table by two men. Another young man joined the two and stretched the waiter’s arms. They thrust an empty beer bottle into his mouth. With his jaw outstretched his dimples became permanent, like they were drilled holes. He was gasping for breath. His stomach and chest thrust outwards as he tried to break free. No one knew who was who and running where. One man had picked a bar-stool above his head and was cursing loudly as he revolved with it in circles on the same spot. Some men and women were sitting under the tables now, on their haunches, with their glasses still in their hands. Short cigarette stubs were still attached forgetfully to their lips. Hansa and Srishti huddled together in their corner. Two men ran towards them. Srishti shouted – ‘baby, bacha, bacha.’ Both her hands were pointing at her stomach. She bent backwards as they came closer, till she finally lay flat on her back, sprawled over the table. The pitcher of beer toppled sideways. The spilled beer made various shapes as it reached the floor. ‘Pregnant, I’m pregnant,’ cried Srishti. A chant followed. Her arms covered her stomach. Hansa was sitting motionless behind Srishti’s body. The ticker of Warren Buffett returned on the plasma screen. Some slow number was playing in the bar, seeming out of tune now. They raised their fists right above her stomach as if they had heard her wrong. That is when Hansa hit the beer mug on the edge of the table and pushed its broken edge in the shorter man’s neck. His flying fist became limp in air as he forgot to cry Rama when in pain. Blood stained his faded white shirt as he stood over Srishti’s body. Srishti was still lying on the table; just under his limp fist. Various eyes rolled as Hansa walked towards the door. The sharp edge of the glass mug still embedded in his neck. A white nip of flesh was hanging near the uneven edge of the broken mug. Blood from the open gash was mixing with the residual beer at the heavy bottom of the mug. They left. The news update changed. The music was forgotten. Anubha Yadav is a writer, academic, film-maker based in New Delhi. She teaches at Delhi University. Her short fiction work has appeared in Cha - The Asian Literary Journal, Out of Print, Reading Hour and others. When not in a classroom she travels with a backpack full of tea leaves. Her work can also be read on her blog.